The Epic Review: Free Castle Grayskullman Mini Comic! Free Castle Grayskullman Mini Comic! Head over to Castle Grayskullman.com and download the first issue in what is sure to be an excellent three part comic series focusing on the mysterious Castle Grayskullman. It's a great read and a true labor of love that Masters of the Universe fans should enjoy. Plus, it's free! Do I need to say more? Check it out! 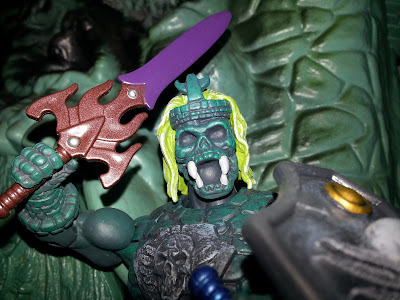 Since Castle Grayskullman was released in November of 2012, character creator Daniel Benedict has went full out in promoting his exceptional addition to the MOTU mythos by creating Castle Graykullman.com, a website where you can watch some hilarious vintage styled commercials for the character and now download for FREE the first part of an exceptionally cool mini-comic. The mini-comic fits in well with the Masters of the Universe Classics canon that has been established through the bios on the backs of the card backs and in the three mini comics released last year with Thunder Punch He-Man, Snake Man-at-Arms, and Dragon Blaster Skeletor. The art (pencils done by Daniel himself) really harkens back to the look of the earliest vintage mini-comics while style reflecting the style and tone of the MOTUC action figures. Man-E-Thanks to Daniel and the great team he assembled for continuing to add to the rich tapestry of mythology that makes Masters of the Universe so special!